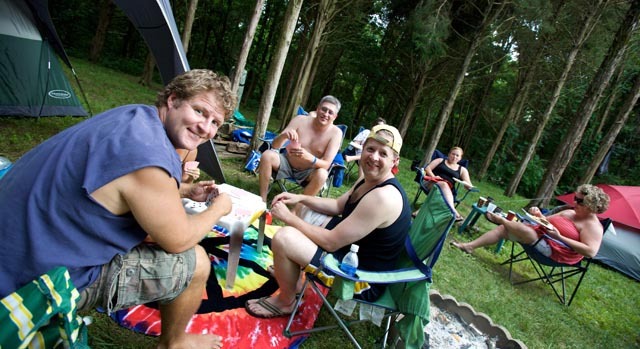 We pride ourselves on providing a quality camping experience. We have been open since Kentucky Speedway's first race. We are not affiliated with Kentucky Speedway. We are a family-owned business operating on our farm near Sparta, Ky., that adjoins the Speedway's property. You will not find a closer, nicer campground that compares with what we have to offer. Below you will find some summaries of what we have to offer. For more details, click on the links above. Parking $10 per night, per additional vehicle, $20 minimum. Limit of three vehicles per site strictly enforced - no exceptions. Towing vehicles and tow-behinds will not be charged for parking, but do count toward the three-vehicle limit. Personal check or money order required to ensure reservations. Edge of Speedway will issue no cash refunds for cancellations. At the discretion of campground management, in the case of a cancellation, credit for a following race may be awarded. Four tenths of a mile flat walk from our front gate to shuttle bus turn around on Kentucky Speedway property. 1.8 miles from our front gate to Kentucky Speedway grandstands entrance area. Over 80 acres of tree lined fields. Season pass holders can choose their own locations ensuring them a spacious site. Porta-potties located throughout the camping area. Camp fires permitted in fire rings.